T-Shirt Relax MEDIUM was relased in August 2015 and is our 50072nd best seller. The ISBN for T-Shirt Relax MEDIUM is 612978287729. 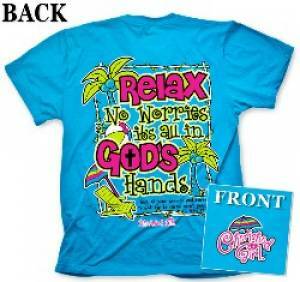 Be the first to review T-Shirt Relax MEDIUM! Got a question? No problem! Just click here to ask us about T-Shirt Relax MEDIUM. Is this a ladies t shirt or mans. there was no indication on the page of what size medium it is. I'm looking for it to fit a lady who is size 12 in clothes. Would this be the right size do you think . A:The manufacturer lists their Medium sizes as being 10-12. Thank you for using the Q&A Forum.